According to a 2009 study conducted by the University of California, San Diego, Americans consume on average approximately 34 gigabytes of information a day. This translates to about 100,000 words of information in a single 24-hour period. Our culture, work and media celebrate our unfettered access to music, videogames, television, and websites. But overloading the human brain has negative consequences. Many people worry what this information gluttony is doing to their mental, physical and spiritual health. When we hear the word gluttony we often relegate our thinking to food or drink and yet the since of gluttony is really exemplified in this idea of information gluttony. Rates of repetitive stress disorders, such as computer-related eye strain and carpal tunnel syndrome (from excess computer use), are rising, along with rates of Attention Deficit Disorder. Lack of focus is a common complaint. Lack of time is another. These are all obvious symptoms that should alert us to the possibility of a lack of connecting you Our Lord. An Internet search for things like “info overload cure,” reveals thousands of articles about what to do. Many of these articles have good advice. 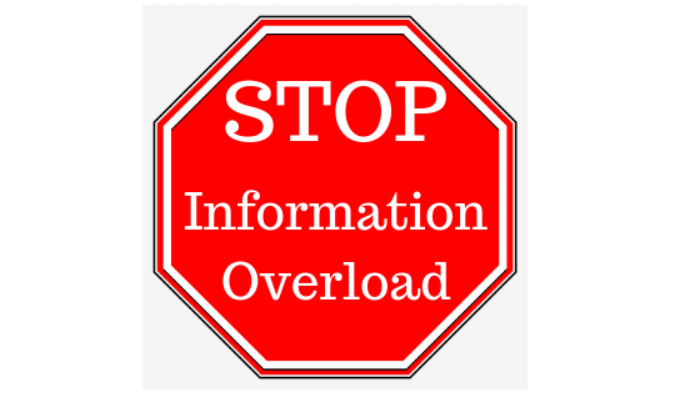 But there again, it's possible to get snowed under by an avalanche of information about information overload. So let’s boil down the actions you can take right now to simplify your life and clear your mind. As the old cliché goes: “Perfect is the enemy of the good.” We often crave the "best" answer or path. But the sheer number of options paralyzes us. Sociologist Barry Schwartz details this phenomenon in depth in his book, The Paradox of Choice. Another favorite is Less is More by Dale Burke. Studies show that when you give people too many choices, they not only freeze up and have trouble deciding, but they also wind up less satisfied with what they choose. The more choices, the less satisfaction. Therefore, I tell you, do not worry about your life, what you will eat or drink…. or how about not worrying about your next decision by overindulging with information? Remember, any time you can limit your choices to get a “good enough” answer instead of a “best” answer, you'll be better off. This is connected to the leadership discipline of delegation. Finally, brothers, whatever is true, whatever is honorable, whatever is just, whatever is pure, whatever is lovely, whatever is commendable, it there is any excellence, if there is anything praiseworthy, think about these things. Of course, as with all principles, caveats apply. If you want information about how to refinance your home, you would obviously want to consult with more than one or two sources. But, in general, err on the side of limiting choices instead of expanding options and most importantly invest in God’s guidance as your foundation. It will bring you peace and joy in all decisions including where to gain your next financing source. How can you start making better choices in order to prioritize your work flow and connect with God? Sometimes – often times – the services of a professional coach can help. In the work I do coaching with clients (www.coach4ldrs.com) people report more happiness and better results with less effort. My coaching is about “Connecting You, Your Work & God”. Older PostDo You Understand the 5 Roles of Leadership?